There is probably an incisive political documentary that could have been made from the footage that was shot for Mitt, but it’s certainly not this one. The behind-the-scenes doc about Mitt Romney’s two presidential campaigns eschews politics and policy almost completely, instead focusing its narrow gaze on Romney the loving husband, father of five, and grandfather of 18. The filmmakers attempts a subtle switcheroo; by focusing on Mitt’s human side, they tacitly call out the media for caricaturing Romney as a slick, flip-flopping politician (the candidate himself even complains about this onscreen at one point). But omitting the politics is a political act, too, and while some may dismiss Mitt as a puff piece, it’s actually a clever piece of anti-mainstream media propaganda. First things first: Romney comes across as a pretty likeable guy here. He’s like a sitcom dad who leans on his loving family for support as he endures a tough few years. 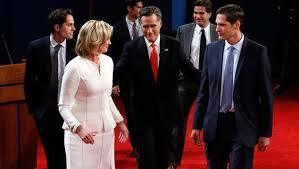 No matter how trying the campaign gets, Romney presides over his clan with good humor and affection. From his adorable habit of picking up other people’s trash to the wry smile on his face in the film’s opening scene (on election night 2012) when he asks his family, “What do you think you say in a concession speech?” – it’s easy to see him through the generous eyes of his adoring family. This might have seemed like a good idea in the editing room, but the final product is something that both Democrats and Republicans will likely find frustrating. I imagine that conservatives will be annoyed that the warm, grandfatherly version of Romney was nowhere to be found on the campaign trail and curse the news media who depicted him negatively. Liberals, on other hand, may have an odd feeling of affection for Romney during the film – then immediately remember how much they hated his policies as soon as the credits roll. The film’s tagline, then – “Whatever side you’re on, see another side” – is true, but that doesn’t make it valuable experience. As a critic, I found it frustrating because there are hints within of a film that could make a more valuable contribution to the public discourse. Its focus on Mitt’s personal life could have served as a much-needed correction to the dehumanizing process of our electoral process. I found myself asking: Why is the Mitt Romney that this film shows us so different from the one I saw on TV? Or better yet: Why are there two Mitt Romneys at all? Perhaps most telling is the moment when the filmmakers ask his son Josh if the campaign is worth all the stress it is causing the family. His response comes in the form of two separate, distinct answers: the one he would give the media (which contains none of his real feelings) and the honest one (that it’s a horrible process and he hates it). That the people who engage in this political process are required to completely suppress their natural instincts and true feelings is an astute observation that could have been the basis for a serious inquiry into both the Romney campaign and the failure of our electoral process as a whole. Instead, we get more myriad shots of Mitt hugging his sons, cracking bad Dad-jokes, and eating dinner with his wife. Despite what the filmmakers would have us believe, this is not the real Mitt. It’s just one side of him that we did not see during the campaign. It’s probably the best side of him. Which makes Mitt less of a human story than a puff piece, although it does elucidate one sad political truth: there is no truth in politics, not anymore, just two separate narratives to choose from. Oh I think Mitt’s forgiveness to his haters is the guy’s actual style and one can hardly say he is political with people like the Clintons. I fully expect Bill to lobby God for some nice 19 year muse and a bottle of Jack Daniels. There he will tell God how he will balance the budget in heaven and see how many trial balloons he will float by the big guy.